While there are plenty of interior finishes for your pool that you can choose from, pool builders Austin Texas are getting an increasing number of requests to have their interiors upgraded to all-tile. The reason is simple: all tile is much more durable, longer-lasting, and creates a luxurious finish that instantly boosts the level of sophistication of the swimming pool and surrounding area. Ceramic tiles can be used just as an accent border by installing one row of tile at the water level or can be installed to cover the whole interior area of the pool, including the walls and floor. The tiles themselves can then be laid in such a way to create unique designs that you won’t see in any other pool. There are literally countless ways to have your pool builders Austin Texas install ceramic or glass tiles to create the perfect interior to your swimming pool. Here are some considerations to make before you have your pool contractors Austin TX install all tiles in your swimming pool. While tiles tend to last a lot longer than other types of interior finishes, you might still want to choose tiles with a lifetime guarantee. It would get pretty expensive to have to change your tiles every so often if damages occur. To prevent this from happening, select tiles that come with a lifetime guarantee against damage as well as color fading. Obviously, the looks of your pool matter, so be sure to take your time choosing a design that will fit both your pool and your tastes. There are decorative tiles with different prints as well as plain ones. You can choose one or the other, or even mix the two to a certain degree. Since there are so many different designs to choose from, you can realistically create a pool interior that will be unlike any other you’ve ever seen. Floor tiles for swimming pools are often blue or white, helping to reflect natural sunlight and making it more aesthetically appealing. These particular colors are ideal for deeper water as more depth can distort tile colors. For the base of the pool, it’s best to avoid dark colors for safety reasons because it will be harder to decipher how deep the pool is. Consider adding some bright colors and decorative patterns to add some interest to the pool’s interior. 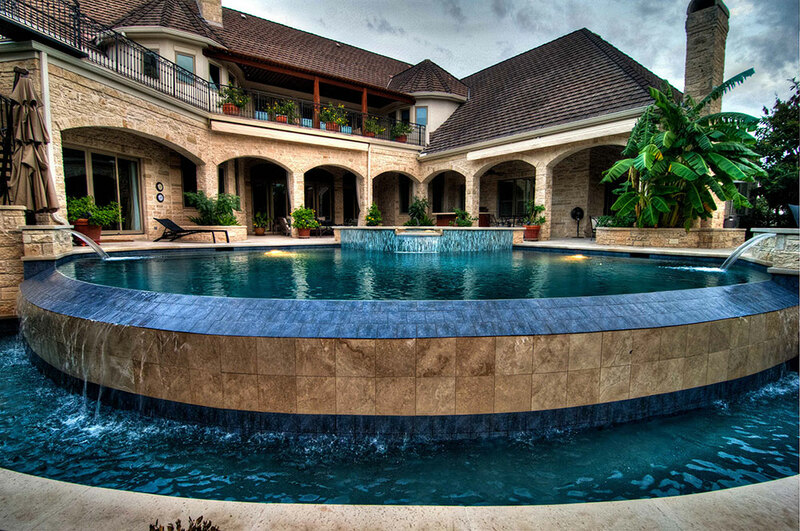 To help you determine the ideal pattern for your pool tiles, contact your local pool builder Austin!